I recently returned from a vacation to Cincinnati, Ohio. Usually when I visit another state, I like to pick up a book on that region's ghost stories. But, an impromptu stop at the Half Price Books store near our hotel resulted in the purchase of ANOTHER region's local legends---Venice, Florida. My paranormal library is already filled with titles from the Sunshine State, courtesy of my sister who always brings me home a lil' surprise from her vacations, but at $4, I couldn't just leave this book behind. Overall, I'm pretty pleased with that decision. As the author discusses, Venice, Florida really isn't known for being haunted. The book gives a pretty good history of the town, which in the grand scheme of things, is actually quite 'new' as a modern city. Of course there is some Native American history there, and a smattering of information on early settlers and explorers, but the town itself really didn't get its start until the 20th century, when city plans were laid out as part of the Brotherhood of Locomotive Engineers. But, we students of ghost lore know that just because a place isn't 'old,' doesn't mean it cannot be haunted! Venice suffers from the same ailment that many cities have---many people just aren't willing to discuss their ghost stories with people. But, as the author discovers, a little digging can result in other leads, culminating with a growing treasure trove of information. 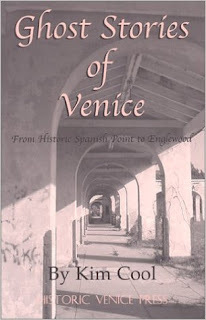 Within the book's 112 pages, the author manages to convince the local citizenry to share quite a number of spooky incidents from Venice and nearby locales. A few of the places featured are the Hermitage House, a residential area known as Venice Gardens, and the San Marco Hotel. Granted, most of the ghost stories are pretty tame, and many are just personal experiences without a whole lot of substance to back them up, but they're entertaining and offer an enlightening glimpse of the unique history of Venice. For the most part, the book is pretty well written, although at times there are awkward repeats of information and the organization seems a little jumbled. However, there are some great photos, lots of interesting history, and a taste of ghost lore from a previously untapped area. If you plan on visiting this area of Florida any time soon, or simply love to read about ghost stories from different regions, this book should be a welcomed addition to your own paranormal library.